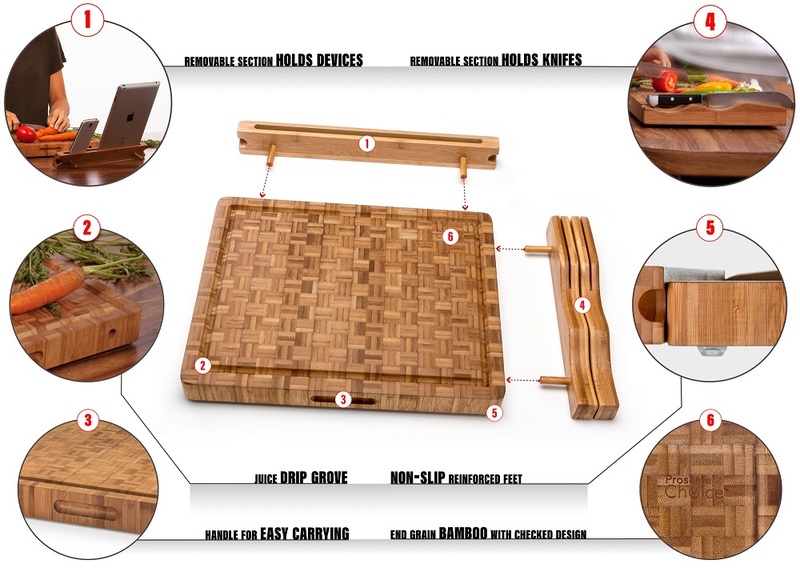 Durable Bamboo Chopping Board: A sturdy and multi-functional all-natural end-grain bamboo cutting board with detachable knife slots and recipe or/and device holder that is pleasing to the eye but also extremely dense with a wide surface area to hold multiple ingredients so home and professional chefs can create kitchen masterpieces without mess or cross contamination. Multipurpose Food Prep Station with Removable iPad and Smartphone Stand and Knife Holder: Functions as a reliable and heavy-duty bamboo cutting block and includes built-in knife holders for convenient access to cutlery, a juice groove that surrounds the edges of the board to trap liquids so clean-up is fast and easy as well as a secure iPad/tablet stand to read recipes directly from your iPad, iPhone, or other tablet or smart phone. FSC(R) Certified Eco-friendly End-grain Bamboo: Made of naturally beautiful bamboo classified as a rapidly renewable resource and responsibly harvested to help support healthy ecosystems, this easy-to-clean cutting board has no added dyes or chemicals, and the end-grain surface is gentler on knife blades and less prone to scarring than plastic cutting boards that can trap bacteria and look worn quickly. Made in a facility certified as socially responsible by the Business Social Compliance Initiative (BSCI) and made of FSC(R) (Forest Stewardship Council), Certified 100% natural bamboo harvested according to forestry standards from sustainably and responsibly managed plantations that support healthy ecosystem. No-mess Working Surface: Large bamboo cutting board with ample room to chop and separate vegetables, meats and spices with ease and includes a non-slip base with built-in rubber feet that give chefs leverage and keep juices or liquids from settling underneath the chop block and help prevent that soupy mess of mildew, fungi and mold that collects under ordinary cutting boards. 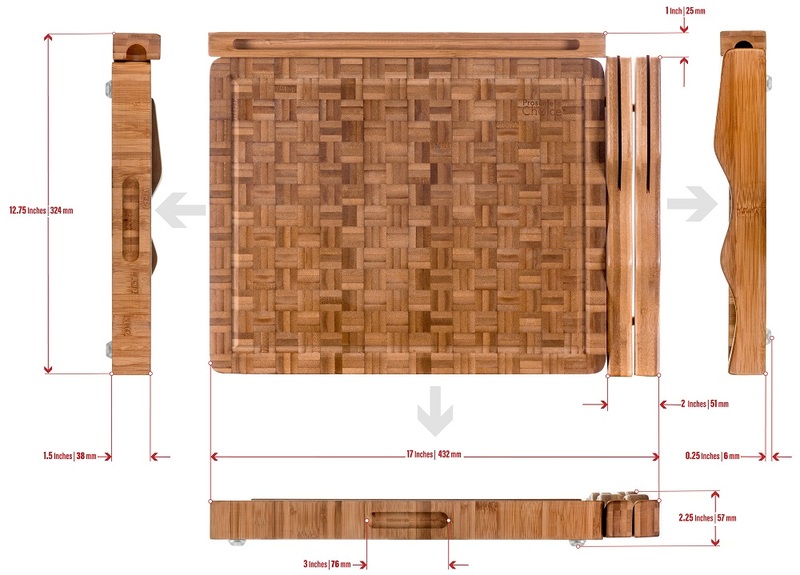 Contemporary Design, Easy to Clean: Easy to clean with soap and water, this beautiful bamboo cutting board includes a unique end grain cross-checkered pattern and a natural color contrast that gives ordinary kitchens a high-end feel and is also elegant enough to be used as an hors d'oeuvres tray or cheese board. Skilled and amateur chefs alike will love this well-designed and very sturdy kitchen cutting board made of all natural and eco-friendly bamboo classified as a renewable resource. 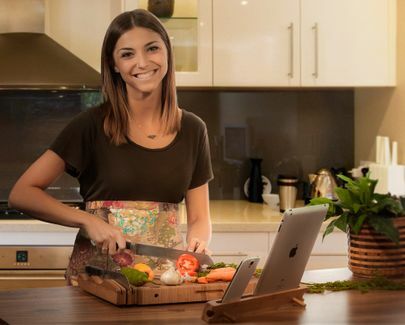 More than just a chopping block, it includes a spacious surface area for easy food prep as well as two slots to hold knives and a slot to secure your mobile device so you can easily read a recipe from your favorite cooking website. Prosumer's Choice Cutting Board Workstation with End Grain Wood also includes a juice trap that keeps liquids from spilling off the butcher block for easier cleanup, and offers chefs plenty of space to slice, chop, and separate ingredients. All-natural, reversible end-grain bamboo wood is sturdy yet gentler on knives than plastic chopping blocks that scar easily and can dull expensive knife blades, and unlike ordinary flat chop cutting boards, includes rubber feet that help keep the board in place. The rubber feet also elevate the board above the countertop so bacteria-susceptible juices and liquids don't collect underneath and your chopping station stays cleaner and more hygienic. 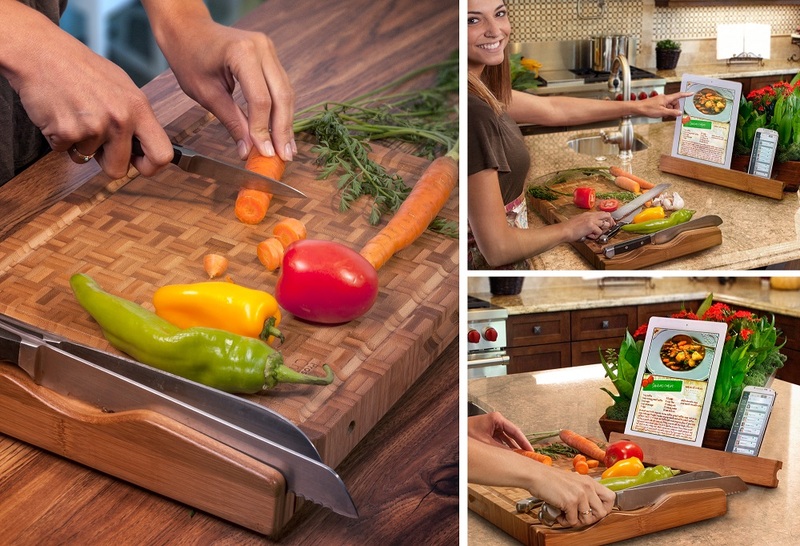 This stunning is cutting block will last through a life-time of recipes and makes a great gift for the foodie in your home.